The upcoming year, 2012, holds a lot in store here at Sterling Ridge. We are celebrating our 20th Anniversary! Can you believe, a once 8 bedroom Bed & Breakfast on 80 acres is now a thriving 360 acre RESORT with 20 log cabins and 2 additional homes! Offering the finest in Vermont log cabin rentals. It all started when Sue & Scott Peterson made a sudden move of selling an employment agency in RI to Innkeepers of an 8 room Inn in Vermont. What a change – and what a ride (think Bob Newhart of The Bob Newhart Show!) The first year they found themselves living in the unfurnished basement with a pregnant Golden Retriever, Sienna. 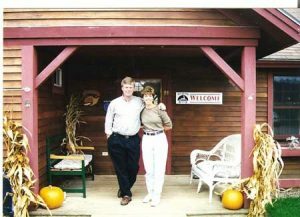 Scott and Sue settled into their new home, while entertaining guests upstairs with scrumptious breakfasts (serving Sue’s Famous Granola) each morning. The summer of 1992 they became the “Choice Inn” for Vermont Bicycle Tours and Bike Vermont, serving 25 hearty appetites breakfast AND dinner. Needless to say, it has been a long road for the Peterson’s, running an Inn/Resort and having a family all at once. So this year, our 20th Anniversary, every month we are going to “relive” the journey of Scott and Sue as they try their hand at Innkeeping!